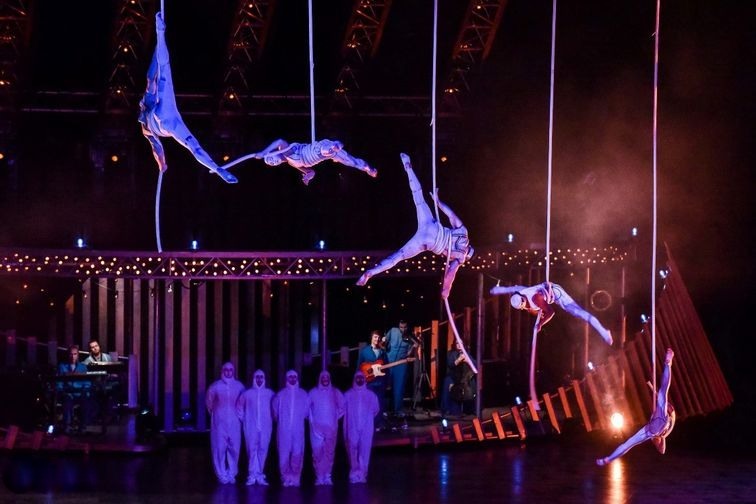 Breaking with tradition, Quidam presents the Spanish webs as a group act. 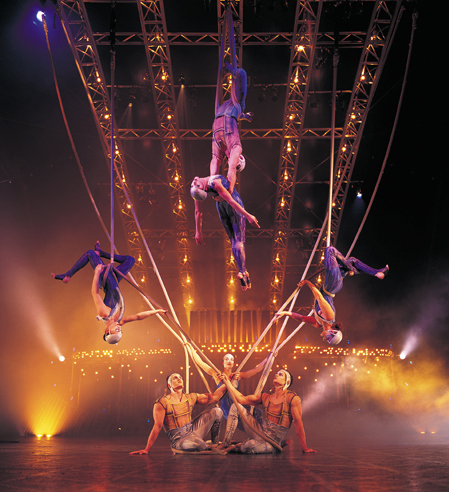 Seven artists fly over the stage, attached to a trolley on an overhead track. 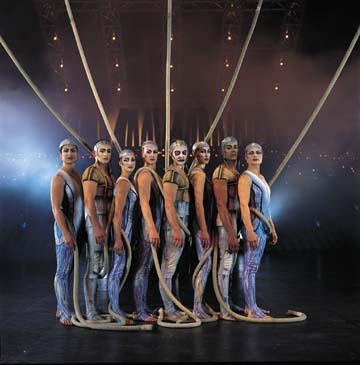 Suddenly, time stands still as the acrobats, in turn or as a group, drop into the void, stopped only by the ropes looped around their waists or ankles. The audience, bewitched, cannot take its eyes off these wizards of the ropes, and only gradually shakes off the spell once the spectacle is over. 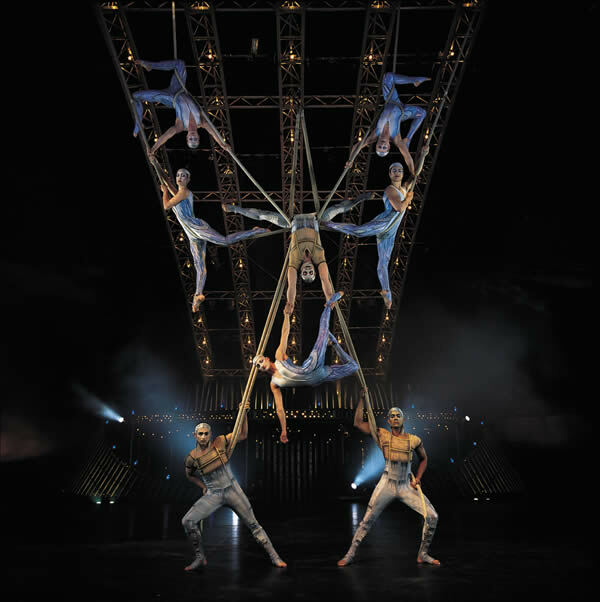 The overhead track brings a series of ropes onto the stage, each with a performer attached, high over our heads. And thus begins the incredible Spanish Web act, with acrobats climbing up and down the ropes, tying them around their bodies and flying through the air. Also known as Corde Lisse, the Spanish Web is an aerial apparatus consisting of a cotton rope stranded or braided to a 3-to-5 centimeter diameter that hangs vertically upon which an acrobat executes various tricks and moves. The Spanish Web may be used with a loop into which the acrobat can insert either the hand or foot to accomplish various feats while rotating, with the help of rotational push provided by an assistant on the ground. 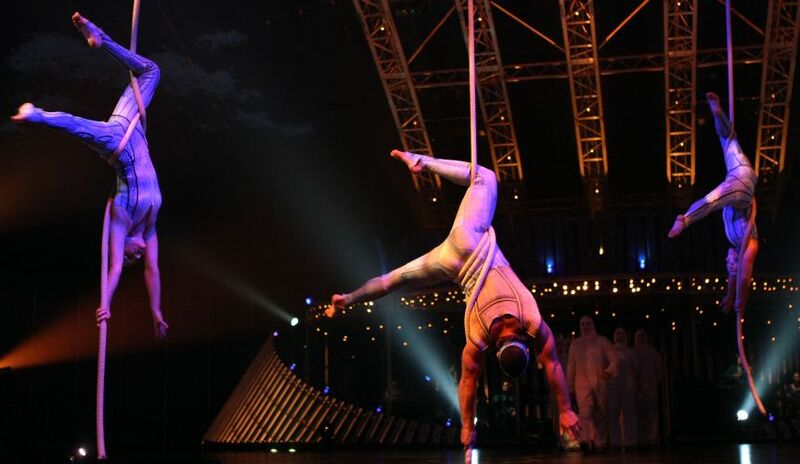 Usually performed solo, this discipline was modified by Cirque du Soleil to be a group performance for Quidam.